Miss Salina is awarded her V.I.P. Ride certificate at NAF Eagles Nest by the Blue Angels Boss and Angel 7, 07/22/2017. On the occasion of this year's Independence Day Air Show at CinSal Airport, in Agrippa (see here), the Blue Angels invited the local owner and long time supporter of the Navy Flight Demonstration Team for a V.I.P. Ride aboard the two seat Angel 7 Cougar. 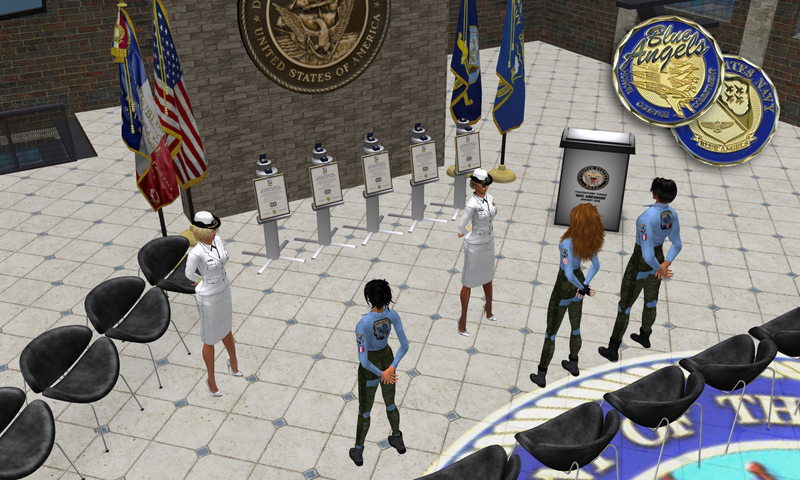 Today she was invited to the Blues home, Naval Air Facility Eagles Nest, to receive her V.I.P. Ride certificate. Miss Salina invited the Blue Angels to CinSal Airport for their first show of the 2016 Season (see here), which marked the beginning of the team's service as a Second Life United States Navy squadron, assuming the role of Navy ambassadors in Second Life just as their real life counterparts do for the United States Navy. Agrippa became the seminal milestone for the Blues and since then we try to visit CinSal at least once every demo season. The team extends the most sincere thank you to Miss Salina, for her support over the years. Few places in the grid makes us as proud and happy to perform at like CinSal Airport, and this year's ID4 Air Show was perhaps the best squadron performance to date. Thank you kindly, Salina. 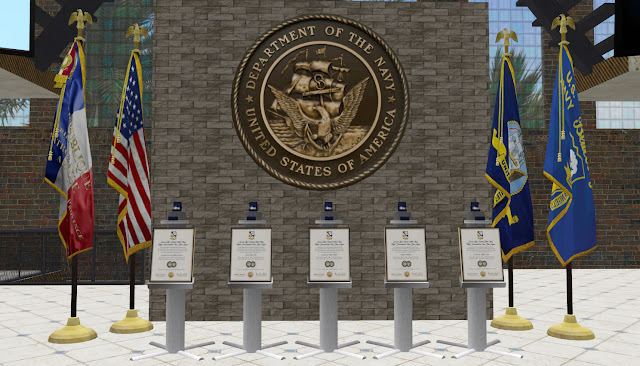 The five Challenge Coins with their respective certificates awaiting their recipients at Miramar. 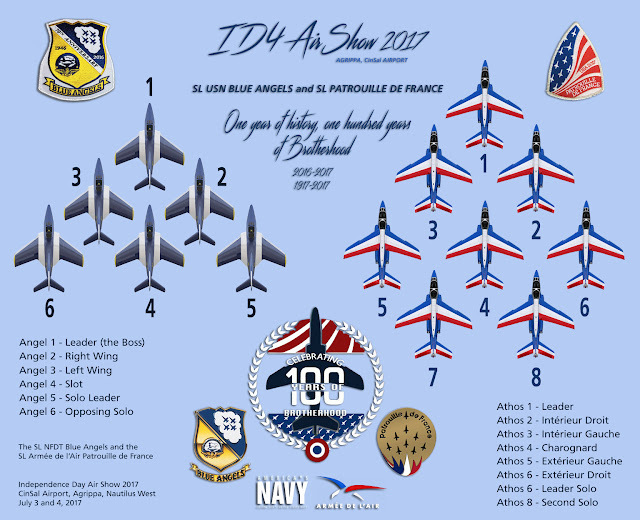 On July 17, 2017, the Blue Angels awarded their Challenge Coins to the pilots of the SL Patrouille de France who flew with them on this year's Independence Day Air Show, at Agrippa (see here). The coins were awarded in a simple but meaningful ceremony at NAS Miramar, the "beach home" of the Blue Angels. Attending the ceremony, were also other Patrouille de France pilots and the Bull Rock Hornets crew that provided SAR support during the ID4 event at CinSal Airport. 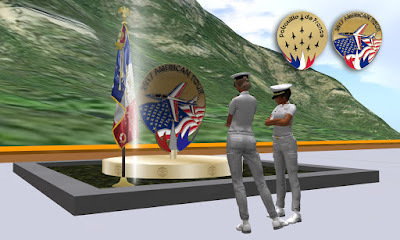 At that occasion, Colonel Rhea Thor presented the Bl;ue Angels with evocative 2017 American Tour medals, the tour emulated by the SL Armée de l'Air Patrouille de France on their visit to Agrippa and the participation on the USA Independence Day celebrations. 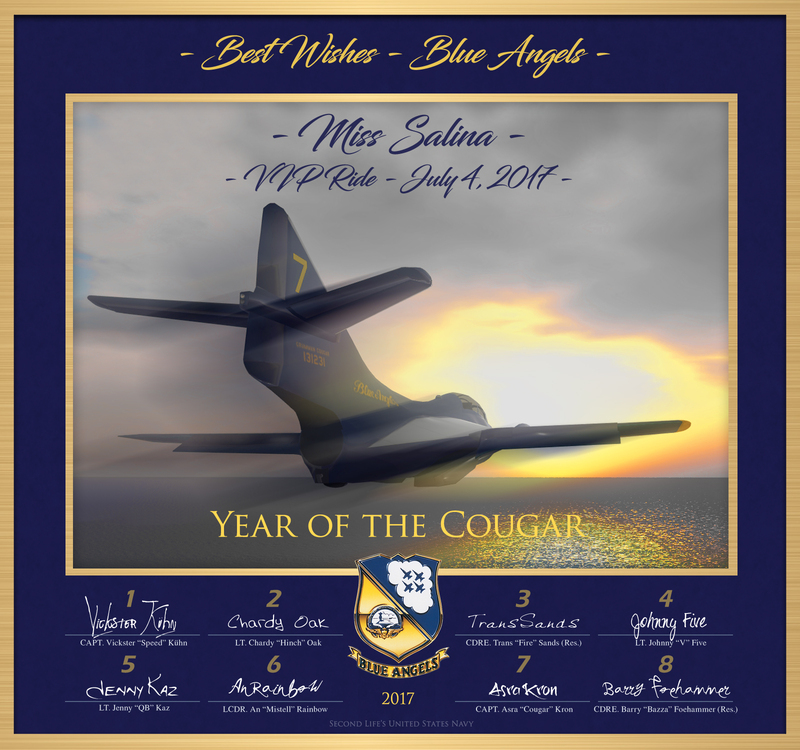 Each Blue Angel pilot that flew on ID4 got an individual medal and two larger medals were awarded for display at Miramar and Eagles Nest. 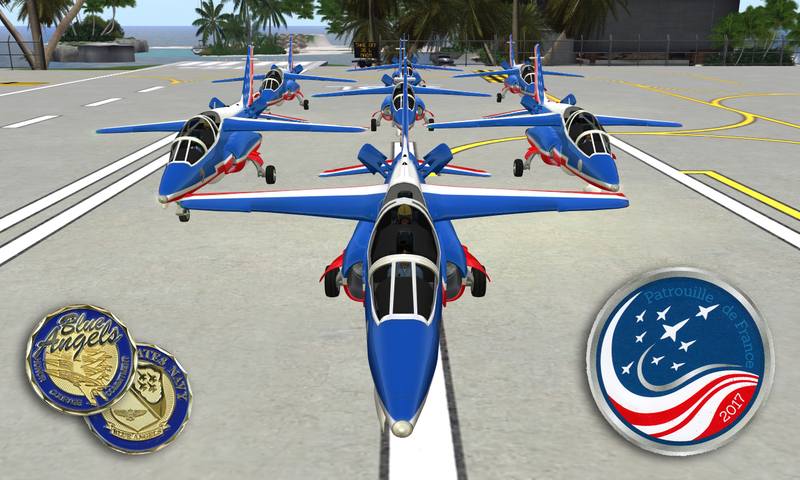 Following the ceremony, the SL Patrouille de France had a practice at Miramar with no less than seven aircraft. Blue Angels pilots CAPT. Asra kron and LCDR. Jenny Kaz took the back seat with Athos 1 and 2 and went along for the ride. NAS Miramar is at the PAFsl disposal for open air practices over the Aldabra Sea and hopefully we will see them in our skies often after the vacations season. CAPT. Kron and LCDR. Kaz did the honors at Miramar. From left, Lcl. Lefavre, Col. Thor and Cdt. Klaber front and center. 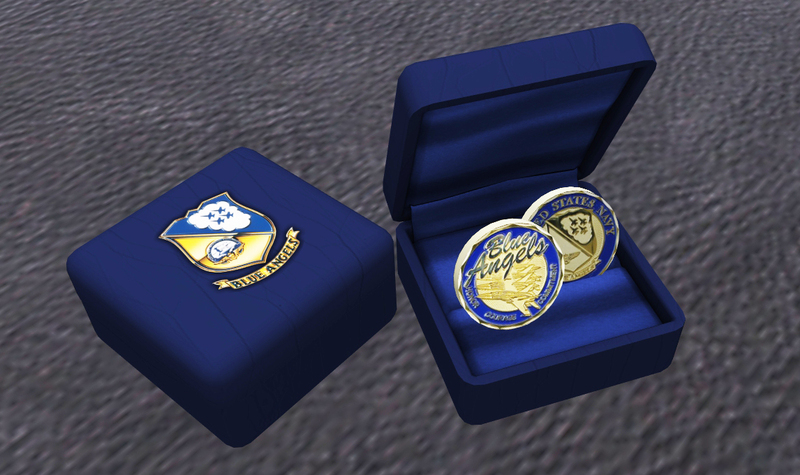 Coins awarded. The Blues salute the French pilots. Seven Alphajets at Miramar for take off! A rare sight. First PAFsl practice at Miramar. To be repeated! The 2017 American Tour large medal on permanent display at NAFEN. Note: Cdt. Myrisse Loon and Cne. Patoulou would receive their challenge coins later as they were not available to be at Miramar due to their real life commitments. Flashback: Paris 1900. July 13 and 14, 2017. I am totally biased when it comes to Paris. As everyone who lives there in real life knows, and especially those who are not that fortunate but had the chance of visiting the City of Lights, as I have in multiple occasions, to be able to walk through the streets of Paris in Second Life is amazing and a heart warming experience. When Lieutenant Colonel Paterne Lefavre told me, after the Independence Day Airshow 2017 at Agrippa (see "ID4 Airshow 2017 Photo Coverage"), that the French squadron would have the privilege of celebrating their National Day in Paris 1900 I was thrilled and couldn't wait for it to come true. It did and it was memorable, as I knew it would be (see "Sous le Ciel de Paris..."). [2017/07/14 08:34] Paterne Lefavre: Do you want to make a run with me? My reaction was not expressed in the grateful reply but in real life I said something like "Do I want to....!! Are you kidding me!!!??" Few minutes later, having switched from my tropical whites to the Blue Angels flight suit, I was standing by the Patrouille de France "Zero" I knew so well from Agrippa; the aircraft Lcl. Lefavre uses for solo trial runs before the air shows. And what followed was unforgettable. I have no words really to express all the photos show, so I will leave them here with brief notes as record of a unique experience I was not expecting and for which I am in Lcl. Paterne Lefavre's debt. To fly in the sky of Paris. A PAF Alphajet on the Champs Elysées. Lcl. Paterne Lefavre, Athos 1, and the "Zero". In the inserts, top to bottom: Ready for take off from the Place de l'Étoile; air brakes extended, facing the unique runway towards Notre Dame; airborne, as the cathedral gets real big, real fast! Zooming towards the Eiffel Tower. I was so excited I did not even think I was not in control of the aircraft as I usually am! I loved every second. In the inserts, top to bottom: Now you see me... Now you don't. The "Zero" merged with the Tour Eiffel on the pinnacle of a barrel loop; exiting the barrel over the Arc de Triomphe and back to the Eiffel Tower. Conserving energy on the drop towards the Étoile for a half cuban over the Arc de Triomphe. In the inserts, top to bottom: going down and rolling at the half of the eight. [2017/07/14 08:47] Asra Kron (x4ten): wheeeeeeeeeeeeeee!!! Once more unto the breach! The "Zero" dives for another pass between the Arc de Triomphe and the Galeries Lafayette Haussmann. Ah, Paris, que je t'aime! In the inserts, top to bottom: triumphant pass; climbing to the sky of Paris. Encore! Full sequence, main and inserts, with the "Zero" in great style. The Alphajets still sport the liveries from the 2017 American Tour the PAFsl mirrored when they honored us with their presence at the Blue Angels Independence Day Air Show this year. For the avid enthusiasts, an excellent coverage of the 2017 American Tour can be seen following this link to an excellent piece by France 2. The landing path. The "Zero" with flaps down and gear extending on a very tight turn towards Notre Dame on the way back from the demo area. On the bottom right corner the audience platform in Paris 2000 can be spotted. In the inserts, top to bottom: the final approach; aligned with the Champs Elysées and a glorious taxi around the Place de l'Étoile. Having done that before several times in real life driving a car (HA!!) the irony was not lost on me, nor was the privilege. The dream run was nearing its end and I had to stop myself from tapping Lcl. Lefavre's zero zero seat and saying what was on my mind: "Again, please!" A dream has come true for me. With Lcl. Paterne Lefavre on the exceptional "tarmac" provided by the Place de l'Étoile, with the Arc de Triomphe as background. I think I thanked him 137 times. Merci de tout cœur, Pat. Bastille Day! July 14th, 2017. 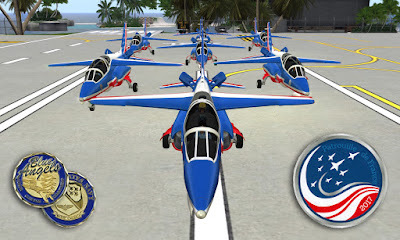 The Patrouille de France (PAFsl) will fly in the sky of Paris 1900 for the French Republic national holiday. 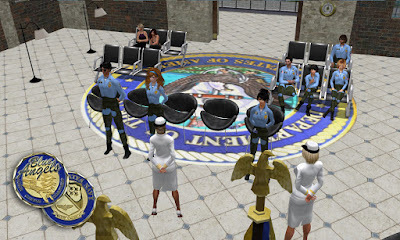 The Air Show will start at 13:00 hours SLT (1 pm) and the organization provides first class seats on an elevated platform outside the demo sim, a breath away from the Eiffel Tower. SLUR for the Audience platform: Go HERE! 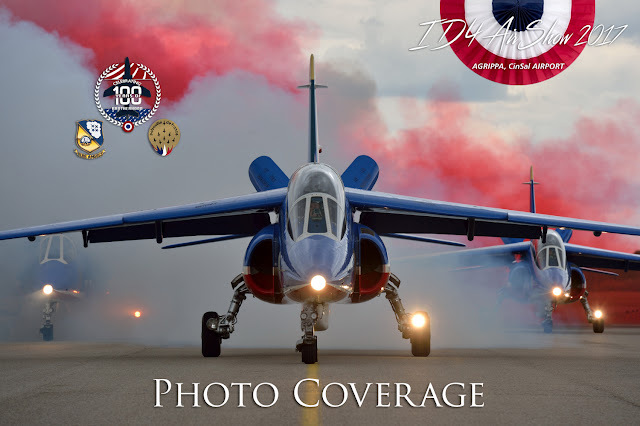 The French squadron will take off from the Champs Élysées in an unprecedented and spectacular event that will place the pilots over the Arc de Triomphe de l'Étoile and the Eiffel Tower, where the demonstration will take place. 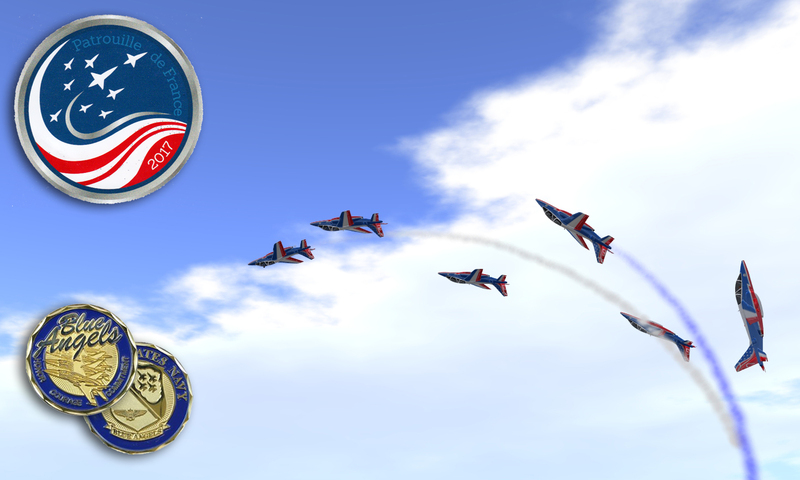 A unique Air Show by the oldest aerobatic team in SL, just as the real life squadron they so well represent is the world's oldest aerobatic squadron. Ten days after the 4th of July, here is the Quatorze Juillet! Update to be placed here after the Air Show! Stay tuned! Update of July 14 below. As usual, click on the images to enlarge. July 14, Champs-Elysées, Paris 1900, France in Second Life. 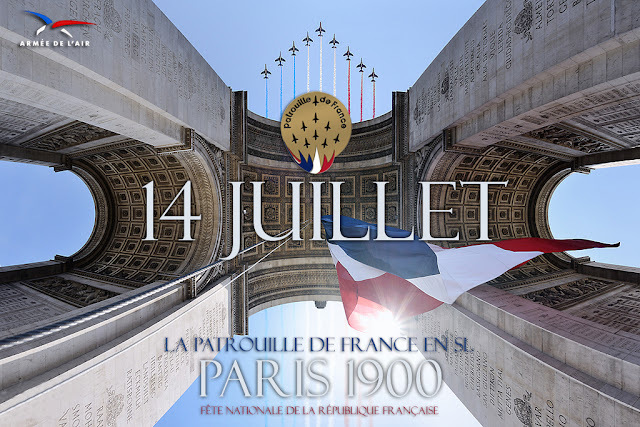 The Patrouille de France makes a dream come true: fly over the most emblematic French city in Second Life, Paris 1900, on Bastille Day. Large - The four Alphajets selected to fly over Paris align in Diamond formation for take off on one of the most amazing and exclusive runways in SL: the Champs-Elysées. For this mission, the chosen pilots were Lcl. Paterne Lefavre, Athos 1, Col. Rhea Thor, Athos 2, Cdt. Gwenblonde, Athos 3, and Lt. Sego Milo, Athos 4. Unlike real life Paris, these Champs-Elysées are condensed, as all Paris 1900 and 2000, and the take off run (and landing) were a STOL exercise. Top right - Final verification on the ground. In reality, only the Leader starts on the Champs Elysées, the Interiors and the "Charognard" (Slot) are on the Place de l'Étoile, Athos 4 has its rear wheels against the plate of the Arc de Triomphe. Must make room! Center and bottom right - Free warm up. Each pilot takes care of preflight individually to make up for the local conditions. Hot and static for take off. Brakes off! (bottom). Paris 2000, bordering Paris 1900, had a platform created for Bastille Day, allowing for a great audience location. For security reasons (a.k.a. lag control!) the Paris 1900 regions were inaccessible to the general public during the air show. I did however chose the top of the Montparnasse Tower to best view the demo from Paris 2000 and try to get some photos from a vantage point. Alas, Paris 2000 was full and lag was a problem, but I did get a few shots and a great (up close and personal) view of the Alphas! Large - C'est parti! The Diamond spear head comes to the top of a loop as Athos 4 recovers. The Panache Tricolor over Paris on July 14th. An amazing occasion. I am standing on the edge of the Montparnasse Tower, visible on the bottom right of the photo - a recurrent sight on these shots! Top right - The Tour de Montparnasse, in a condensed Paris in SL overlooking the Place de l'Étoile and the Champs Elysées. The audience platform can be spotted to the right of the tower. Bottom left - The Diamond spear head zooms at very low altitude over the Arc de Triomphe. One of the many occasions I had to point the camera down! Too bad I was struggling not to crash and to be honest I was focused on watching this unique event through my own eyes rather than through the camera lens but still managed a few decent shots. A wonderful air show and a day to remember, when the PAFsl took to the sky of Paris. More next year, please! Large - Athos 1 and 2 break on a tight looping getting very close to the Montparnasse Tower and the region border (notice how close I am! - bottom right of the photo). The two pilots demonstrated again how well they go together. Always a pleasure to watch, and a great lead by Lcl. Lefavre. Top right - The audience on the platform below could be heard from the top of Montparnasse Tower as the Patrouille de France made the sky of Paris more beautiful. Applauses and cheers at each loop, cuban eight and roll. The spear head seen in great style at yet another loop top. Center and bottom right - One final tight looping before the four tricolor Alphajets headed for the tight landing I had the privilege to experience the day before (see here!). A memorable occasion was about to reach the end, but the party would go on after in Paris! Vive la France et Joyeux Quatorze! Very nice video of the occasion, courtesy of Papillon (a.k.a. Carole Renard). Merci, Pap!! Note: For my adventure the eve of Bastille Day, see "An American in Paris". TROPICAL WHITES TWA women specs - mandatory. (*) This is an EPIA item available through NSTC. Contact your CO for details. 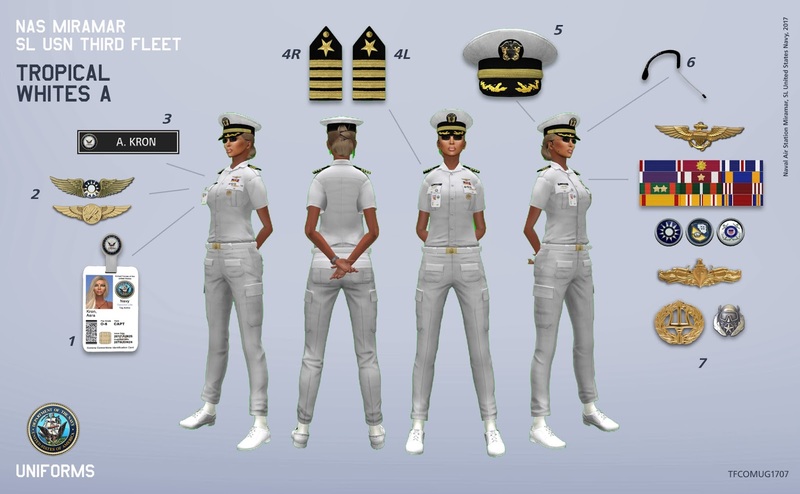 (**) Adjust shoes to fit and edit face of sole, heel make them white, do not change textures. Edit face of each shoe lace and make them color HEX e8e8e8, change the texture to Blank. 2. Wings / Badges on right chest pocket flap (see notes) [ standard issue NASM ]. 3. USN Name Plate - Chest plate Initial / Last Name 2017 - [ standard issue NASM ]. 4R. Shoulder Board (right) - Shoulder Board R Rank - [ standard issue NASM ]. 4L. Shoulder Board (left) - Shoulder Board L Rank - [ standard issue NASM ]. (*) Cover acquired directly from Jayson Zorric (link with price) from Art of War. Mind grade. 7. Wings / Badges / Ribbons above and on left chest pocket (see notes) [ standard issue NASM ]. (*) plus white socks cost. The number of wings/badges used can be substantial and to avoid multiple attachments we provide our officers with a linked set with room for all of them with a single attachment point. Ribbons are also provided in a linked set of racks, custom made to each individual, with a single attachment point. Right chest above pocket: Name plate. Right chest pocket flap: shown AVG Wings, AIRR Wings [ given as earned ]. Left chest above pocket: shown NA Wings, Ribbon Rack [ given as earned ]. Left chest pocket flap: shown Service Pins, SWO badge, Diver Supervisor badge [ given as earned ]. Left chest below pocket flap: Command Ashore badge [ given as earned ]. Refer to your CO for correct placement. All plates, devices, wings and badges are EARNED. They can only be obtained through TFCOM. Use of any items of this kind acquired with off the shelf outfits is not accepted. Please click on the image to go to the dedicated ID4 Air Show 2017 photo coverage page. 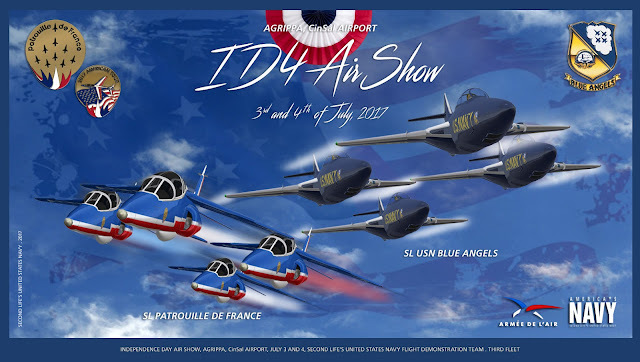 Cliquez sur l'image pour accéder à la page de couverture photo ID4 Air Show 2017. This page will be in permanence on the right hand column of this weblog (look for the icon). To ID4 Air Show 2017 details click here! To the complete ID4 2017 photo coverage click here! Save the day(s) and this space. Complete layout and information uploading. Welcome to the 2017 Independence Day Air Show at Agrippa's CinSal Airport. And welcome to the fifth air show of the SL USN Blue Angels 2017 Season. The Air Show will start at 13:00 hours SLT on Monday, July 3rd, and Tuesday, July 4th. Agrippa - CinSal Airport - USE THIS SLUR! MacDuff - USS Defiant - USE THIS SLUR! 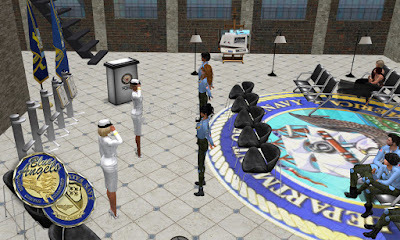 It is our privilege to fly for Second Life audiences all across the grid, demonstrating the precision techniques of naval aviation, hoping to inspire a culture of excellence and service. The maneuvers you will see demonstrated at Agrippa are coordinated tactical techniques developed by navy and marine corps pilots in both peace time training and actual combat. These maneuvers are neither stunts nor daring feats but are refinements of basic techniques taught to every prospective naval aviator. At CinSal Airport we will demonstrate these maneuvers at very low altitude in traditional Blue Angels formation so that you may see and take pride in the precise fashion in which your navy and marine pilots are trained to fly. 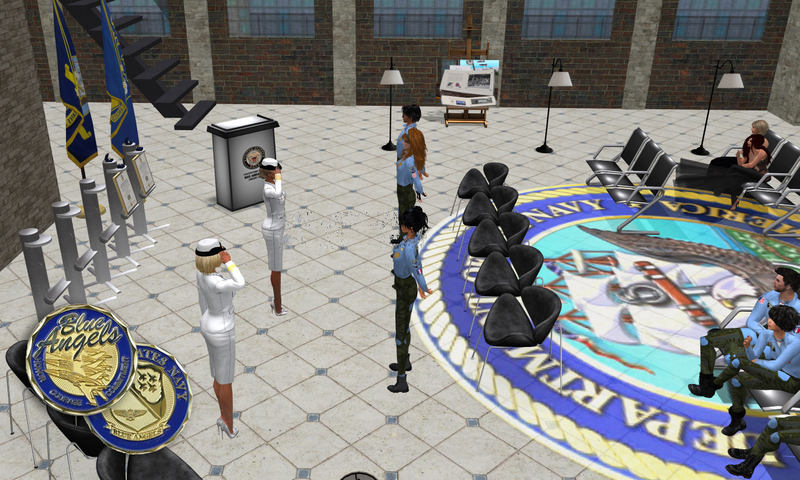 Audience areas are on the Southeast corner of Agrippa, CinSal Airport (20 seats) and on MacDuff sim on a USN Third Fleet frigate, the USS Defiant (36 seats). Please stay out of the circuit sims described in the show layout below. If you choose to watch the show from a private vessel at sea, proceed to one of the neighboring sims. Local airport personnel and Liberty Fire Department personnel will be on hand to help you find the best seat from where to watch the show. They will have landmarks and other information available on site. FOR THE COMPLETE ID4 AIR SHOW 2017 PHOTO COVERAGE CLICK HERE!